This recipe is PERFECT for the summer! No cooking inside required! It's already hot enough in the summer, I don't like to turn on the oven or make a big mess over making a meal. This requires just firing up the grill and a lil knife work. Not to mention how light and refreshing this is.... this won't leave you feeling sluggish or heavy. Fire up the grill. Prep the salsa first, it will need some time to chill in the fridge. 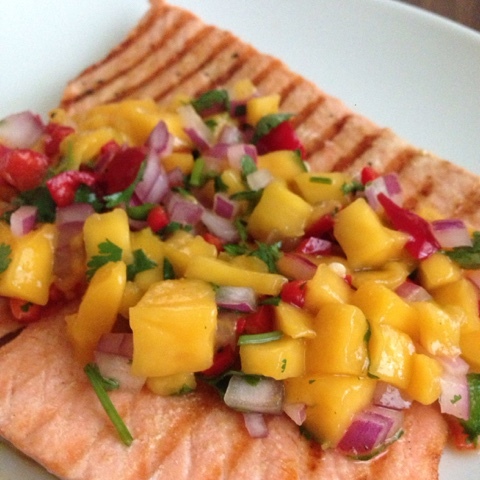 In a bowl, mix mango, red bell pepper, red onion, cilantro, jalapeno, lime juice, and lemon juice. Lastly add salt to taste. Cover, and chill in the fridge at least 30 minutes before serving. Plate salmon first, then add salsa on top! Super easy, flavorful, and a great summer dinner!